Late last month, just six days before the debut of American MONUMENT, an installation created by the artist lauren woods for the University Art Museum (UAM) at California State University, Long Beach, that focuses on police brutality and institutionalized racism, UAM executive director Kimberli Meyer, a key collaborator on the project, was abruptly fired. When she arrived at CSU Long Beach, Meyer did so with the intention of using her position as a vehicle for, among other initiatives, staging and organizing pointed exhibitions, installations, and public programs that would deal directly with issues of anti-Blackness, police brutality, and institutionalized racism. American MONUMENT was developed by woods—who stylizes her name using all lowercase letters—and Meyer as the inaugural work for this new focus and as a collaborative project where Meyer and CSU Long Beach played the key role of institutional steward for the project. 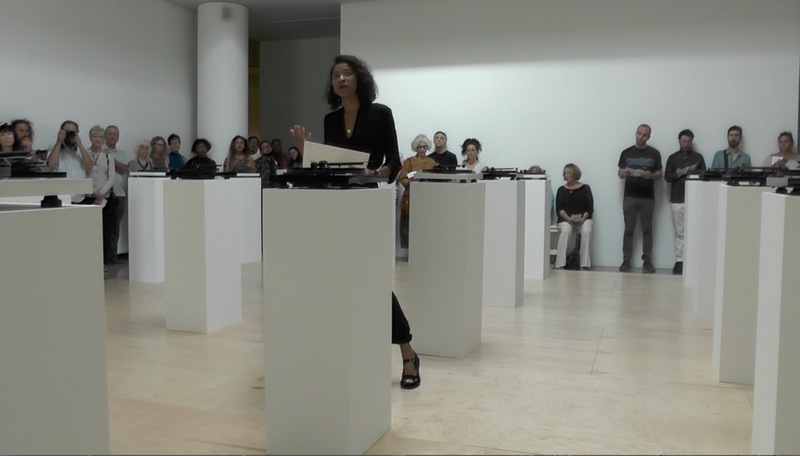 The installation was developed as a group of 25 freestanding displays, with each stand featuring a record player that would play sound clips related to recent episodes in American culture that highlighted the pervasive and forceful presence of institutional racism against African Americans, including the murders of Tamir Rice and Trayvon Martin. The recordings, obtained mainly through Freedom of Information Act requests, include police reports, court transcripts, witness testimonies, and even recorded audio captured by bystanders, according to the American MONUMENT blog. For the installation, visitors are invited to pick up each of the turntable needles in order to activate the sound sculpture. [American MONUMENT] prompts the consideration of the cultural circumstances under which African-Americans have lost their lives to police brutality. The new-media monument is conceived to be nomadic and continually expanding, with the UAM serving as its launch site and steward. The artwork provides a vehicle by which to analyze the complex relationship between the construction of race, material violence and structural power. Meyer told The Architect’s Newspaper that her approach had initially received push-back from university administrators who were fearful that exhibitions and programming centered around African-American voices and explosive themes like police brutality and institutionalized racism would incite racist, “tiki torch-bearing” mobs against the university. Despite institutional unease, however, work on the installation pushed toward its September 16th opening date. Meyer is currently appealing her firing. While they wait for the lengthy administrative process to play out, she and woods have proposed the creation of a “parallel museum” to allow woods to “unpause” the monument. Essentially, the proposal, if accepted, would allow Meyer and woods to carry on their work and the ongoing research that was meant to be developed over the course of the run of the installation under a separate, independent administrative vision that would be part pop-up, part sanctioned occupation of the museum. With their own staff and organizational structure, woods and Meyer hope to pioneer a new way of approaching how institutions address issues of structural racism.